At CES 2019, Huawei announced the new MateBook 13, a 13-inch Ultrabook packed with the latest technology at a relatively low price. The Huawei Matebook 13 features 8th-generation Whiskey Lake, full-power processors, 8GB of RAM and up to 512GB of RAM, with an optional Nvidia GeForce MX150 GPU. This all powers a 13.3-inch 2K (2,160 x 1,440) touch display. This will all be powered by a 41.7Wh battery that Huawei somehow shoved into the tiny chassis, which should allow for up to 10 hours of battery life. The laptop will be available later in January for $999 (about £780, AU$1,410) for the Mystic Silver Core i5-8265U model. Users can opt for the Space Gray Intel Core i7-8565U MateBook 13, with Nvidia MX150 graphics for $1,299 (about £1,025, AU$1,830). Not only does the Huawei MateBook undercut Apple's MacBook Air, which starts at $1,119 (£1,119, AU$1,849), but it does so while offering more powerful hardware. The Huawei MateBook 13 features 8th-generation Intel Whiskey Lake U-series processors, which out-power the fan-less Amber Lake processors in Apple's latest laptop. That's not even taking the MX150 graphics included in the Core i7 model, which will easily trounce the MacBook Air's Intel UHD Graphics 617 GPU. Though, you shouldn't expect great gaming performance, especially at the MateBook's native resolution. Huawei was able to fit the Ultrabook-class components in a small, portable chassis, too. Measuring just .59 inches (14.9mm) thin and weighing just 2.86 pounds (1.3 kg), it's thinner than the MacBook Air at its thickest point, and just a bit heavier. Huawei understands that cooling a full-fat processor in a laptop this thin and light is going to be important – especially when packing full-fat Ultrabook processors. To address this, it's including a unique Shark Fin Design 2.0 cooling system, which Huawei claims should increase airflow by up to 25%. When it comes to security, the Huawei MateBook 13 will feature the same One Touch biometric tech as many of its phones, built into the power button. All biometric data will be stored locally in the device, rather than the cloud. However, while both the MacBook Air and Huawei MateBook 13 only have two USB-C ports and a headphone jack, Apple's laptop is compatible with Thunderbolt 3. The Huawei MateBook 13 is not. 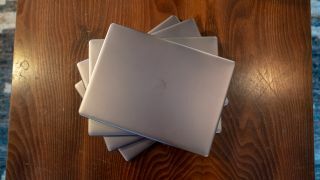 Stay tuned for a full review to see which does the whole "ultra-thin laptop" thing better.